Provided a diverse range of on-site IT services. Supported home users, small businesses, churches, and schools by repairing or installing around 450 systems in central Alabama. 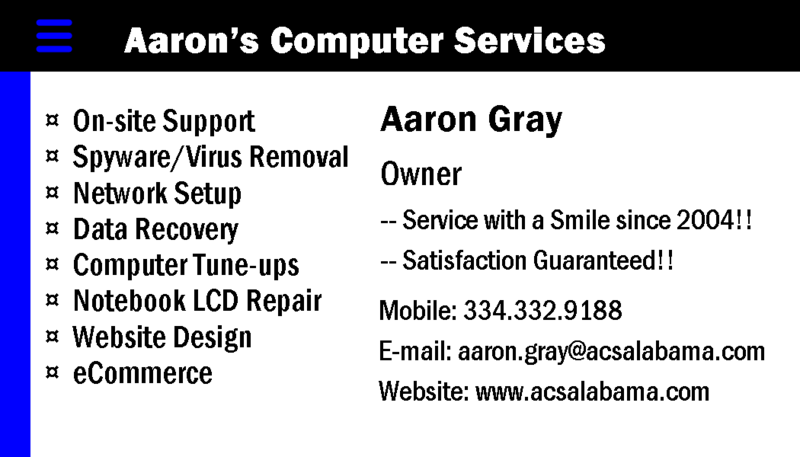 This was a typical IT shop, offering hardware and software troubleshooting, data recovery, networking, virus removal, WordPress website design, and web marketing consulting. It was a good lifestyle business to help me get through high school and college – for most of the 2000’s, this little business was my baby. It was lots of fun working with people in their homes and offices – I met many interesting people and had some great conversations over the years.